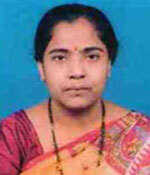 Dr. Kalpana Saha(Roy), H.O.D of Computer Sc. & Engg. obtained her B.Sc (H) in Physics from University of Calcutta, B.Tech in Instrumentation & Electronics from Jadavpur University, M.E in Computer Science & Tech. from B.E College( IIEST). She has done her Ph.D in the area of Mobile Computing and Wireless Communication. She is currently teaching Software Engg, Operating system, Numerical methods and Artificial Intelligence & Robotics. Her research interest are Mobile Computing and Wireless Communication, Machine Learning.